Sky5 showed thick, white smoke billowing out of all open windows. FLORISSANT, Mo. — One person was rescued from a house fire in Florissant early Thursday morning. Firefighters responded to 2020 Splendor Drive. Sky5 showed thick, white smoke billowing out of all open windows. Several firefighters surrounded the house, working to put it out. Two people were in the home when the fire started. One person tried to get the other person out of the home, but suffered some cuts and couldn't pull the person out, Florissant Valley Fire officials said. When fire crews arrived, they were able to safely rescue the person left inside. Both victims were taken to a nearby hospital for breathing in smoke. They're expected to recover. The Florissant Valley Fire Protection District said there was one act that kept the fire from being even worse--the victims slept with the bedroom doors closed. "The single greatest factor that improved the victims' outcome was sleeping with bedroom doors closed," fire officials wrote on Facebook. They shared photos from inside the home. One picture showed the charred remains of the kitchen area, while two other photos show bedrooms untouched--almost as if they were taken in another house. 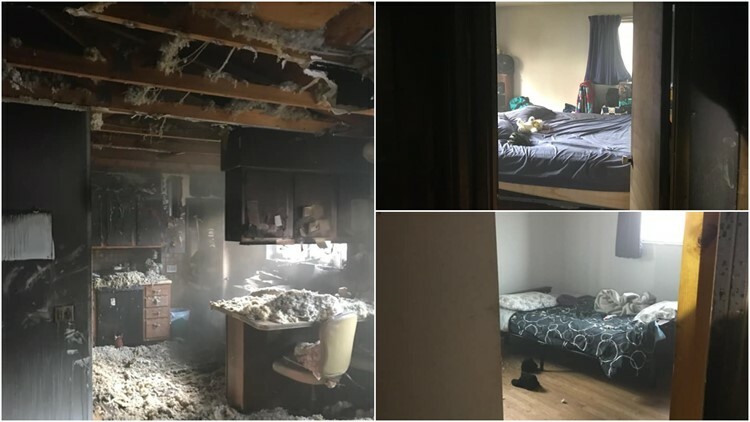 "These pictures are taken from the same location in the home and show how closed doors allow for survivable areas in the structure," Florissant Valley Fire wrote online. Firefighters from Florissant Valley, Hazelwood and Black Jack Fire Departments responded to the scene. They continue to investigate what caused the fire.